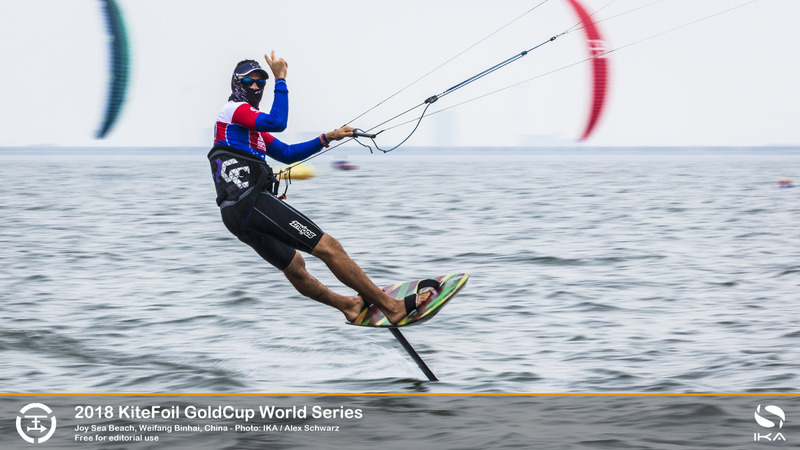 Reigning International Kiteboarding Association (IKA) KiteFoil World Champion, France’s Nico Parlier, edged his way up the order at the KiteFoil World Series being fought out off Weifang Binhai’s Joy Sea Beach in eastern China. The multiple world champion notched up a win and a third place in the only two races of the day after the early, shifty offshore breezes died completely. The finishes helped move Parlier up to third spot overall at the end of the second of five days of racing. But Britain’s Connor Bainbridge, the overnight leader thanks to a dominant first day on the Yellow Sea’s windward-leeward track, retained his lead at the top of the standings after he grabbed a win and a less auspicious seventh spot. The Briton had a slice of luck in the day’s first race when he was forced to tuck into the pack at the start as he had forgotten to wear his timing watch. But his superior pace and strategy on the two-and-a-half laps of the course were enough to secure a comfortable win. 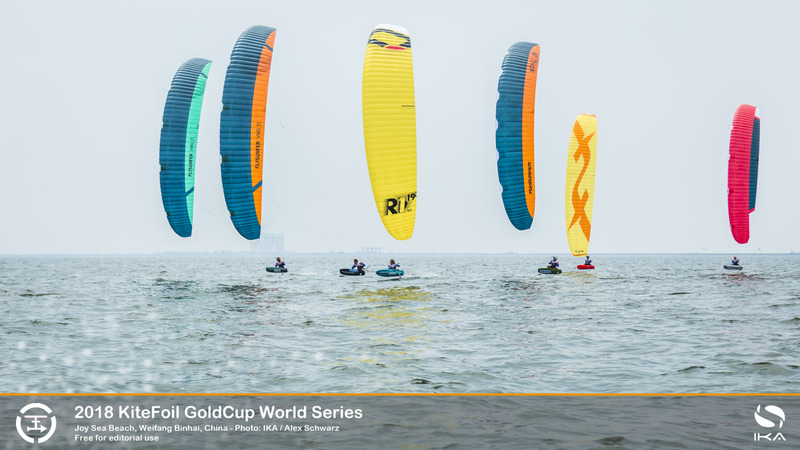 The KiteFoil World Series season-opening event—with its total prize money of €60,000—is the first of four scheduled tour stops set to reach a climax in Muscat, Oman, in December, when the overall best athlete will be crowned 2018 World Champion. 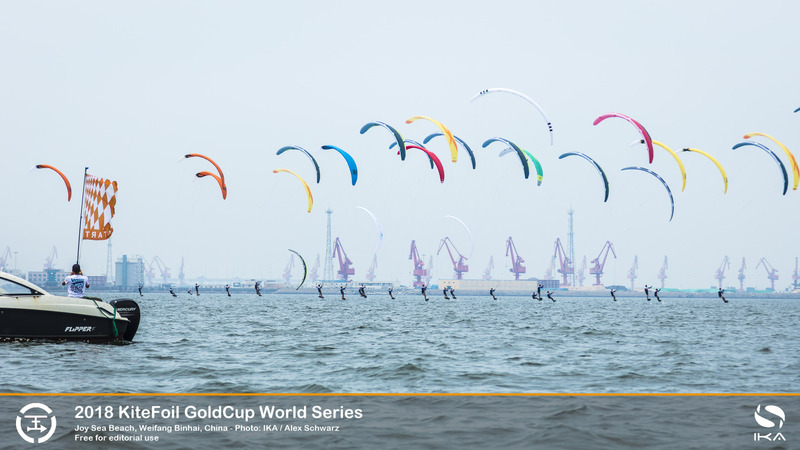 For the first time China is hosting back-to-back tour stops, with the racers heading south to Fujian province’s windy Pingtan island next week for the second act of the unfolding drama that has drawn all the world’s fastest kitefoil athletes. 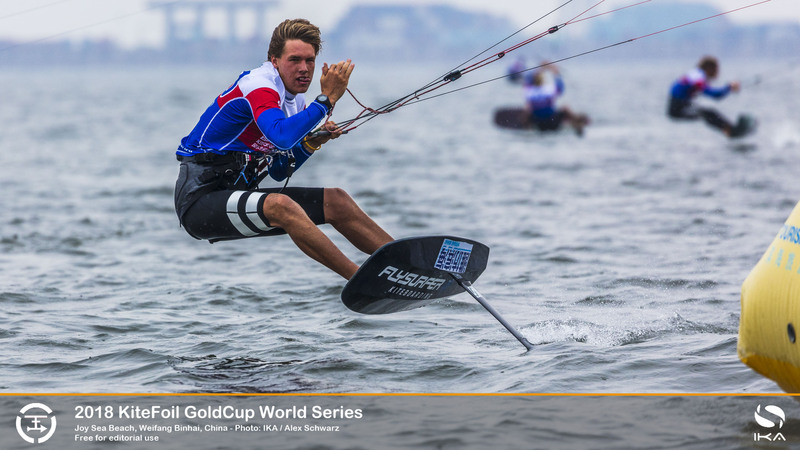 The field packed with talent in Weifang has seen the head of the fleet jockeying for position, with Bainbridge the surprise package as he burst into the competition and held the lead for the second consecutive day. But in his day’s second race, as the breeze dropped to barely 6kts on parts of the course, Bainbridge struggled to make sufficient ground upwind to lay the top mark, and he was forced to tack back as Parlier rounded ahead, setting up his win. Parlier had spotted the wind shift just before the off and chose to begin near the start boat giving him and fellow countryman Axel Mazella a healthy lead on the track that they maintained all the way round, landing them first and second spots. By contrast Monaco’s Maxime Nocher suffered the same fate as Bainbridge and finished slightly down the order, but it was enough from him to retain his second spot on the leaderboard ahead of Parlier. Britain’s Guy Bridge, recently crowned Formula Kite European Champion, did his best to shrug off an ill-starred opening day, notching up second and third places that moved him up to ninth spot overall. But he acknowledged he needs many more races in the hope that he will be able to maintain his consistency and discard two further poor early scores, one of which was the result of a retirement when he tangled with brother Olly Bridge. France’s Théo de Ramecourt slipped one spot to fourth overall, unable to quite match an excellent first day, but nonetheless buoyed by his performances that keep him very much in the hunt for a podium finish. In the women’s group, racing with the men, the US’s triple Formula Kite World Champion, Daniela Moroz, again retained her lead over Russia’s Elena Kalinina.